Year 26: Off to Jool! Third Time's a Charm? Or is this the Fourth? 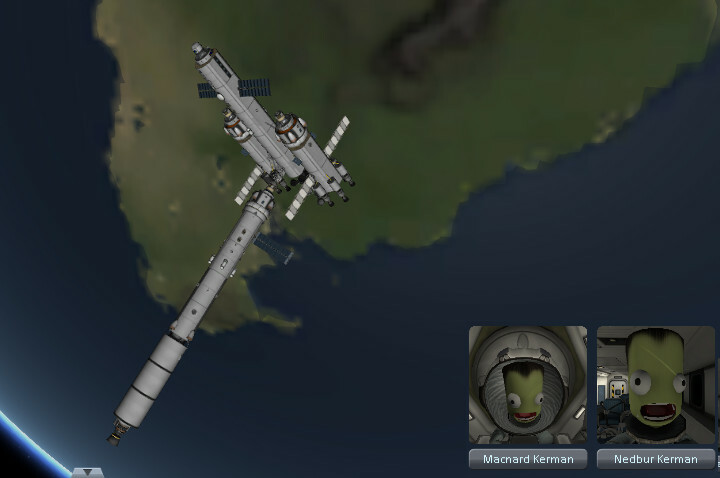 It's finally time to launch our most recent set of rescue craft off to Jool. Here goes Sherbert and Gwenlin in their craft. Wait... are you guys sure you're aimed in the right direction? They were. We were trying to do things in one long burn. A really long burn as we are using underpowered nukes. 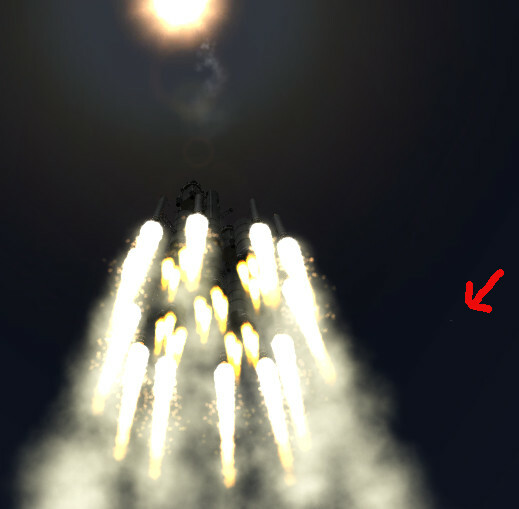 They ended up in a pretty good Jool trajectory. Ludbart and Josy-jo here might look cooler but they burned a lot more fuel to not much purpose. We were trying to be fancy and have three shorter burns across three orbits, but it turns out the crew in the tracking center really didn't have the skills to pull that off efficiently. Well now we have a couple of years before anything interesting happens. What should we be doing? Suddenly an order comes across to start mysterious Operation Patillas. No one is sure what it's all about, but it involves a lot of money so there weren't many questions. 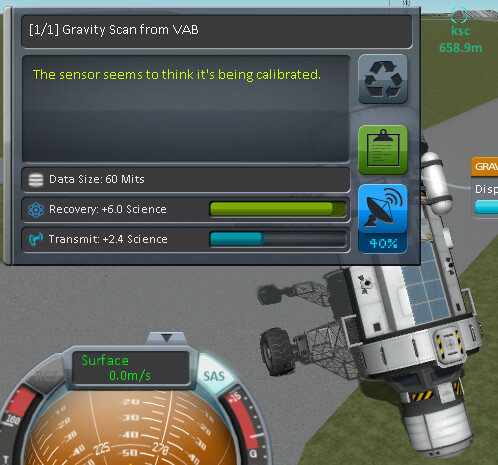 This project apparently needed some new rover development. Originally the operatives in charge asked for one that weighed 30t but then gave up giving advice after this happened. We replaced the test driver, but I think we should fire this one too. Ummm... I meant to do that, he radioed. I found some amazing science in the ground here. Someone must have found one of those Vacation on Sunny Dres fliers lying around, as that's apparently the destination of this craft. We saw a mysterious star while launching, not sure what it was but there's a 90% chance it is Minmus. Didn't realize you could see it from the ground. 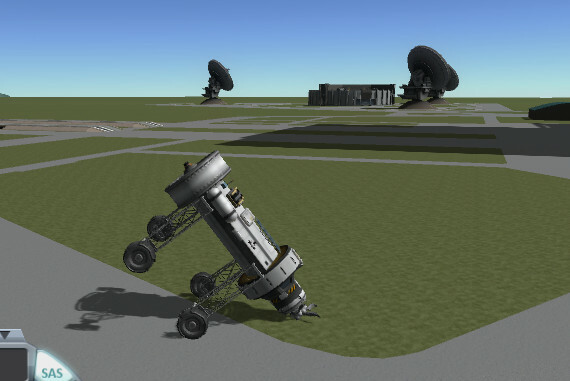 That launch went poorly, we actually started re-entry before we finally managed to pull the perapsis out of the ground. ***EMERGENCY*** I don't think this view is supposed to be possible. Luckily we managed to somehow get back to a normal map view without crashing or losing our save. 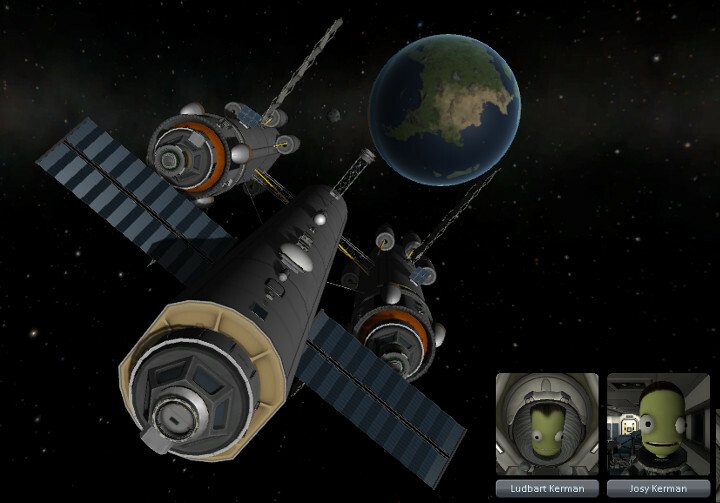 We had left Kimchee in orbit with a half load of fuel, and due to great planning coincidence she was right near the Dres craft. 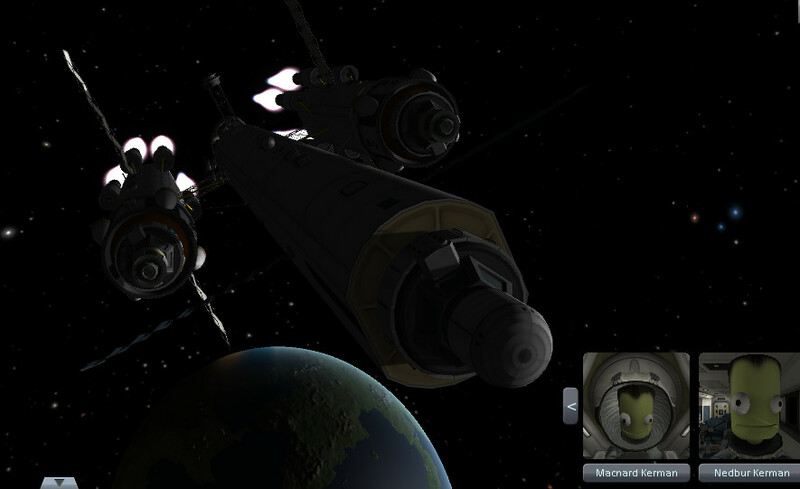 So we docked and transferred some fuel over. Time for Kimchee to head home! 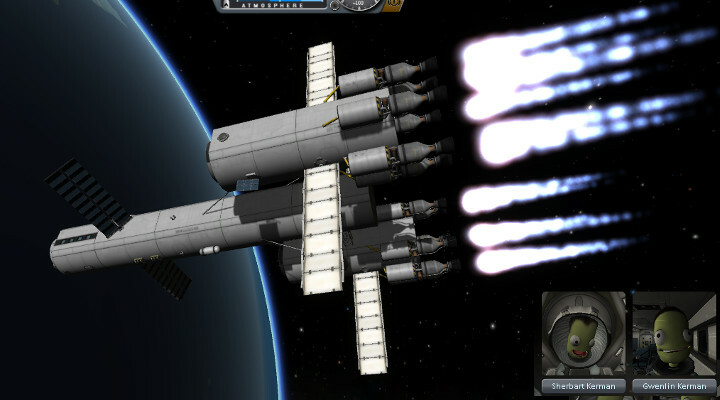 Fairly uneventful, though she overshot KSC a bit. Also the fuel tank exploded on landing and the engines sank to the bottom of the sea. 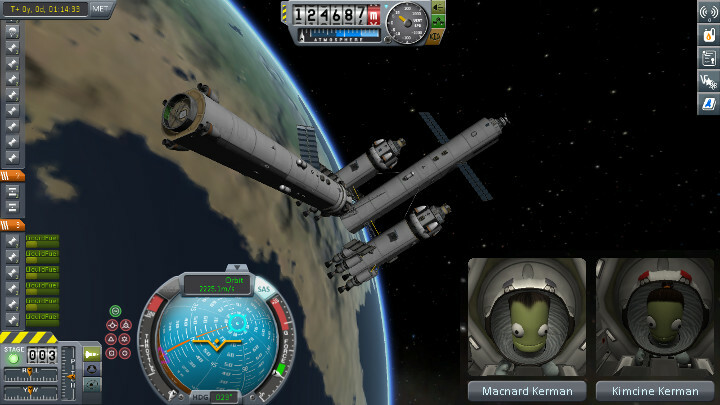 Here's Mac-nerd Kerman looking grim as a refuel mission also delivers a rover. We're going to leave it strapped to the back, hopefully it's roughly behind the center of mass. Also hopefully the thrust-to-weight ratio is enough to land somewhere (the engineers were too lazy to do the math). Time to launch Kimchee on the final refuel mission. 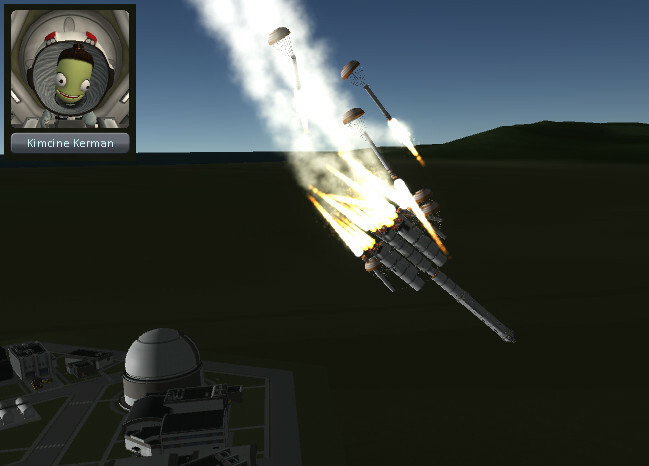 Hey I heard somewhere we can recover some boosters if we strap some parachutes on them. Great idea, how could that possibly go wrong. 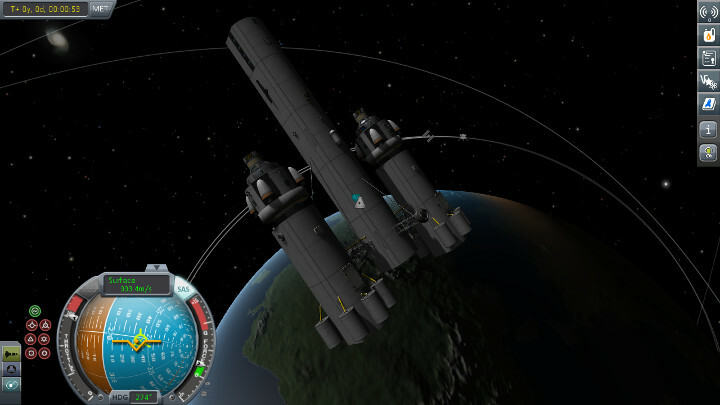 We did get launched properly and *finally* docked. It took a long time, you can see Nedbury was getting a bit impatient. Off to Dres! I love this ship design. And man, it's hard to get an intercept on Dres, almost worse than Gilly.